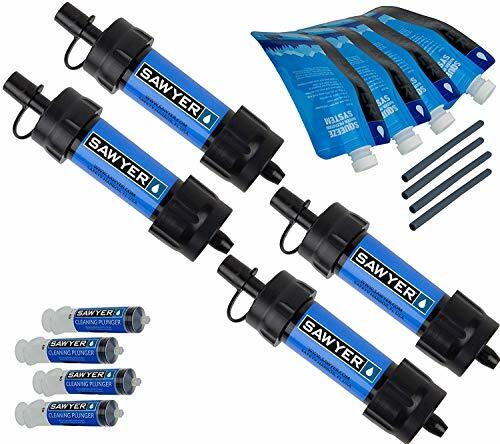 A lightweight, versatile personal filtration system, the second-generation Sawyer MINI Water Filter fits in the palm of your hand and has a total field weight of just 2 ounces. Perfect for everything from camping with the kids to traveling abroad where tap and bottle water can't be trusted, the tiny MINI provides 0.1 micron absolute filtration for clean drinking water on the go filtering out bacteria, protozoa, and microplastics. The MINI filter removes 7 log (99.99999%) of all bacteria (like salmonella) as well as other harmful bacteria which causes cholera and E. coli and 6 log (99.9999%) of all protozoa such as giardia and cryptosporidium. These removal rates equal or exceed other filter options. EPA guidelines allow ten times more protozoa left in the water than Sawyer MINI filters allow. The MINI also filters out 100% of microplastics. Great for outdoor recreation, hiking, camping, scouting, domestic and international travel, and emergency prepping, the Sawyer MINI gives you a number of ways to access clean water. Attach it to the included drinking pouch, use the included straw to drink directly from your water source, connect it to hydration pack tubing (sold separately), or screw it onto standard disposable bottles (28mm thread). The Sawyer MINI Water Filter is rated up to 100,000 gallons. It comes with a 16-ounce reusable squeeze pouch, 7-inch drinking straw, and cleaning plunger (per packaged MINI). Sawyer individually tests each and every MINI unit three times to performance standards before packaging. The MINI 0.1 micron absolute filter houses a cluster of micro-fibrous tubes which use similar technology found in medical dialysis. As water passes through the side walls of the tubes, harmful bacteria and protozoa are trapped on the outer walls so you can be confident your water is safe to drink. Since 1984, Sawyer Products has offered the best, most technologically advanced solutions for protection against sun, bugs, water, and injuries -- everything from first aid kits developed for wilderness to point-of-use water filters that filter contaminated water to levels cleaner than U.S. bottled water. 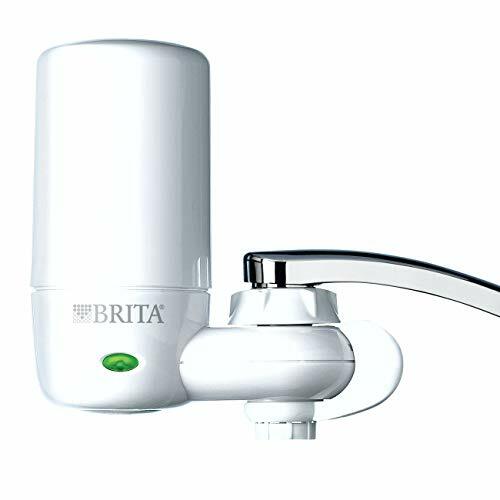 Brita Complete On Tap Faucet Water Filtration System filters out odors and impurities for healthier, great tasting water in a sleek white finish. Brita is the world's #1 brand of water filtration. This complete faucet mount removes 99% of lead and reduces chlorine (taste and odor) and asbestos contaminants* commonly found in tap water It features an extra layer to trap sediments and smaller contaminates. One Brita water filter can provide up to 100 gallons of filtered tap water, replacing over 750 standard 16.9 oz. plastic water bottles, which cuts down on waste and saves money. This certified Brita water filter system attaches directly to standard faucets in five easy steps and includes a built-in filter indicator to signal the need for replacement after approximately 100 gallons or 4 months, whichever comes first. This model does not fit pull-out or spray style faucets. Get better taste on tap with the Brita White On Tap Faucet Water Filter System. The convenient Brita on-tap faucet filtration system not only saves space, but also uses a long-lasting filter providing great-tasting, cleaner water straight from your tap. Available in chrome or white finishes, the system attaches easily to your faucet in minutes without any tools necessary. Brita s faucet filter reduces chlorine, lead and other impurities from your kitchen spout. Brita's faucet filtration system reduces contaminants that can often be found in tap water. One Brita on-tap faucet filtration system, including one dispenser and one filter. AQUACREST water filter is the right choice for you!!! AQUACREST water filter is designed to improve your life with clean, great water. Strict quality control guarantees uncompromising filtration performance. You can feel assured that you and your family are getting the most out of your water. A great replacement for your original filter. Our professional R&D team focuses on delicate design and reasonable structure, which ensures precise and leak-free fit. To maintain the best performance, it is recommended you operate the filter within operating specifications and replace every 3 months or 100 gallons, whichever comes first and will vary with your water quality and water consumption.  Better Water: No matter for drinking, cooking, brewing coffee or making tea, you deserve refreshing and great-tasting water for better enjoyment.  Stronger Water Flow: Highly efficient filtration ensures you have quick access to clean and crisp water. No trickle, no waiting.  Filter Life: Change your filter every 3 months or 100 gallons, whichever comes first will vary based on water conditions.  Manually Reset: If the Indicator doesn't turn green after changing, please follow the instruction to reset it manually. Remove the filter, find a white box that sticks out with a button beneath where the filter normally goes. Press the button, and it will pop out. Insert the filter, put it back on.  Compatibility: Interchangeable with PUR RF-9999 water filter; For use with PUR Advanced Faucet Mounts and PUR Advanced Plus Faucet Mounts. This filter is not sourced by or sponsored by PUR. The manufacturer's name and part number have been used for reference purposes only. 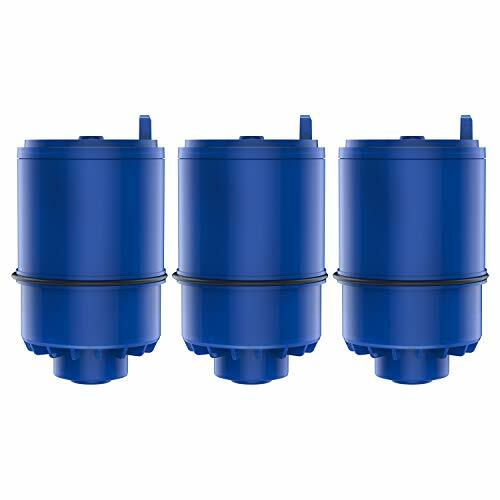 Product Description The Culligan FM-15RA Advanced filter lasts for 200 gallons, or 2 months and filters out atrazine, chlorine, lead, lindane, sediment, turbidity while removing bad taste and order. Don t settle for lower quality water when cleaner water is so easy. From the Manufacturer The Culligan FM-15RA is a replacement filter cartridge for the Culligan FM-15A faucet-mount filter system. This advanced filter reduces Lead, chlorine taste and odor, bad taste and odor,Lindane, Atrazine,Turbidity, and particulate class 1. The filter has a life of up to two months or 200 gallons. DOES NOT have a shelf life and expiration date.For technical assistance contact @ 800-721-9243. Enjoy clean, fresh tasting water directly from the faucet.NOTE: Kindly refer the user manual before usage of the product. 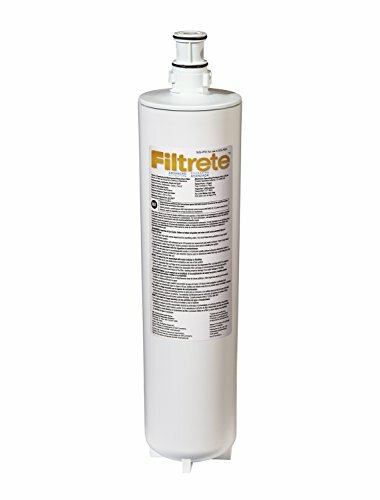 Filtrete Drinking Water System Refill. Now you can have cleaner, great tasting water at your convenience, fresh from your tap. Filtrete under-sink water filtration products are easy to install, with no mess, long lasting replacement filters that can be changed with just a twist. And using filtered water from home as an alternative to bottled water. You will need an adjustable wrench and a screw driver. Turn off the cold water supply and remove supply line to faucet using wrench. Install push-in fittings to faucet and cold water supply line. Install filter mounting bracket to area under sink. Install filter to mounting bracket. Cut tubing to length to fit between filter and supply line and from filter to faucet. Connect the tubing. Turn on water supply and enjoy cleaner, better tasting water. It is not compatible with DWS 1500. Warranty: This product will be free from defects in material and manufacture. 3M makes no other warranties including but not limited to any implied warranty of merchantability or fitness for particular purpose. If this product is defective, your exclusive remedy shall be, at 3M's option, replacement or repair of the 3M product or refund of the purchase price of the 3M product. 2. Install filter into your machine as seen in above pictures (just click any picture to be able to view all of the steps). 3. Enjoy your drink! Remember to replace filter after 30 days or 30 tank refills for best results! 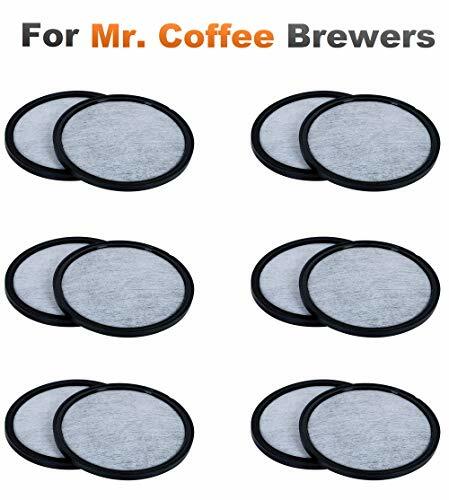 UNIVERSAL FIT - These Mr Coffee water filter replacement discs made by K&J will fit all Mr Coffee brewers that take the disc style of charcoal filter, making it easy to determine if these will fit your machine or not. Just look at the shape! AEROLACE ACTIVATED CARBON MICROMESH - Ensures maximum exposure to absorption material without using carbon granules that would otherwise let contaminants through and even clog up your Mr Coffee coffee maker. K&J is the highest quality of any filter currently sold! IMPROVES BEVERAGE FLAVOR - Removing impurities, calcium, chlorine, and odors with activated charcoal filters creates the best-tasting beverages. ECO-FRIENDLY PACKAGING - We ship your Mr Coffee compatible filter replacements not in a bulky box, but with minimal packaging. Filters are individually wrapped. 100% SATISFACTION GUARANTEE - If for any reason our filters do not meet your expectations, simply email us back for a full refund! K&J makes the most effective filters on the market! Filtrete standard Capacity Whole House System Refill, 2-pack Carbon Wrap. Filtrete Standard Capacity Whole House System Filters filter water throughout your home, protecting your plumbing and appliances from Chlorine Taste and Odor, Sand, Sediment, Silt, and Rust. Great for 2 or less bathroom households. Universal filter replacements are available in pleated, string wound, carbon wrap, and grooved filters. Filter life replacements available in 3 and 6 month versions. INCREDIBLE CAPACITY/LIFETIME: 50,000g or 5 years! CuZn Backs The UC-200's Performance with a 5 year Pro-Rated Warranty and all CuZn Products Carry a 90 Day Satisfaction Guarantee. 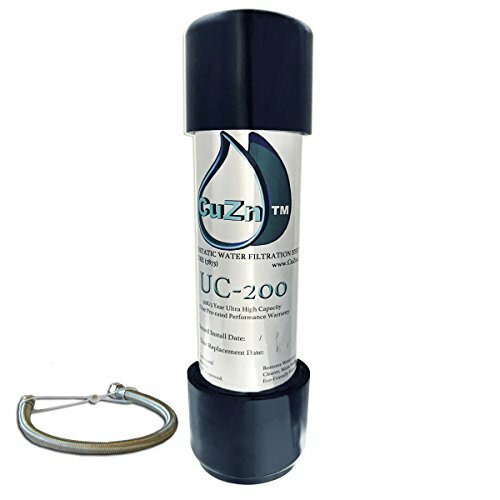 The UC-200 is Designed for use with Municipal Water not Private Well Water. The UC-200 is a Water Purification System, it is NOT a Water Softening System. 3 STAGE FILTRATION PROCESS: Micro Sediment Membranes, KDF-55 & Coconut Shell Carbon. The UC-200's Process Purifies the Water Without Removing Health Beneficial Hardness Minerals, The UC-200 DOES NOT REDUCE TDS READINGS, a PPM or TDS Meter is Not Effective for testing. To Monitor The UC-200 with Testing, Utilize DPD#1 Chlorine Test Strips and Replace when Chlorine Breakthrough is Detected. Want TDS Removal? Search ASIN# B019N7VG1W on Amazon to View CuZn's Reverse Osmosis System. COMPREHENSIVE SUPPORT POLICY: The UC-200 is Fitted with 3/8 Male Compression Inlet/Outlet Fittings & comes with a 36 Long 3/8 x 3/8 Braided Stainless Steel Compression Hose. Have Non-Standard Plumbing or an Alternative Install in Mind (such as dedicated filtered water only faucet)? Contact Customer Support, We'll Supply an Install Kit for All Non-standard Installations at No Additional Cost to You! 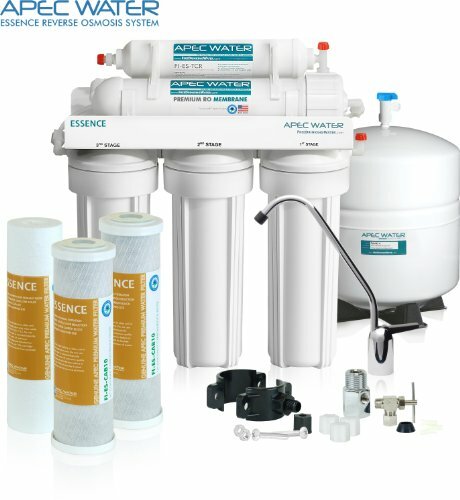 As America's favorite brand of reverse osmosis systems, and backed by iSpring s industry-leading customer support, the RCC7AK is unequaled in quality, performance, and durability. The system consists of 6-stage, layered filtration built around precision reverse osmosis (RO) technology that removes over 1000 different kinds of contaminants in order to provide the best home drinking water filtration available. Unlike some other systems, the combination of both GAC and CTO filters in the 2nd and 3rd stages provides extra layers of protection against harmful chemicals than CTO alone. It features a 75 gallon-per-day capacity RO membrane, which is larger than most in its class and provides the capacity to economically handle the drinking water needs of even a large family. After flowing through the initial 5 stages of the iSpring RCC7 line of Reverse Osmosis filtering products, the RCC7AK model adds another Alkaline Remineralization (AK) stage. 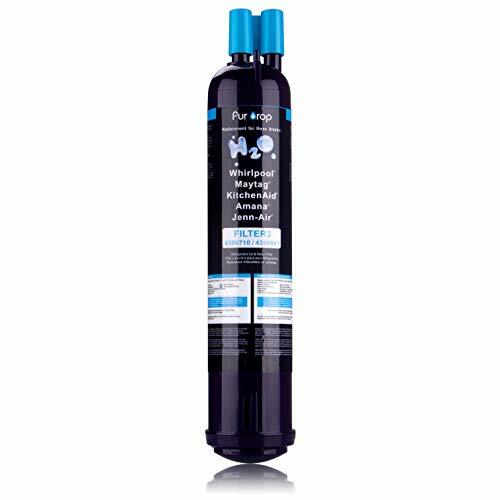 This stage is designed to restore the natural alkalinity and mineral balance of the water. The RO process effectively generates pure water but it also removes a few helpful minerals in the process. The red mineral stone portion of the AK filter adds back healthy minerals including not just calcium, but also other beneficial minerals, like magnesium, that other systems don't. The calcite portion of the filter neutralizes the pH of the RO water. And the water tastes better too. Because RO water is so pure, some people may find it tastes unnatural. Many people prefer the more natural taste that comes from the presence of some minerals in the water. Remineralization restores just the right proportion of healthy minerals. Designed for do-it-yourself installation by most users, the entire system fits nicely under a standard kitchen sink. Installation is straightforward and all parts necessary for installation are included. You are guided by clear, well organized written instructions, instructional videos and access to iSpring s unparalleled technical support. The system is quiet and low maintenance with no moving parts. Replacement filters are standard sized and sold at factory direct pricing. A lead-free, solid brass faucet with brushed nickel finish is included with the system and is usually mounted on the counter as the primary source of drinking water, but output lines can also be connected to your ice maker, coffee maker, etc. 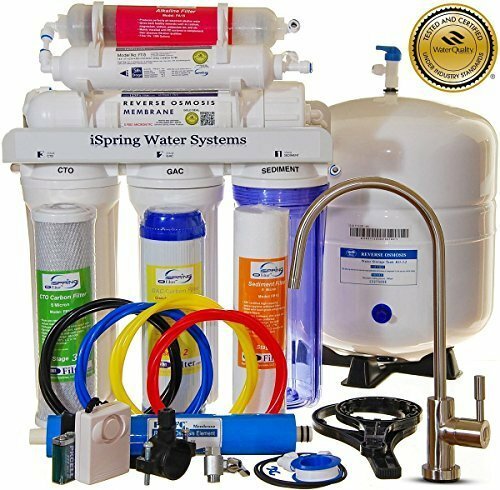 The whole system is backed by a 1-year money-back guarantee, a 3-year manufacturer warranty and iSpring's unique lifetime technical support provided right here in the USA in Alpharetta Georgia. With the iSpring RCC7AK, enjoy crisp-tasting, bottled quality water, every day, right in your home. Easy, do-it-yourself installation, typically in a couple of hours with industry-leading help just a phone call away. Fits under a standard kitchen sink, with all parts included and clear, well-organized instructions and videos. For leak-free installation, simply push tubing inch deep into quick-fitting connectors and lock - no threading pipes needed. Enjoy unlimited ultra-fresh, clean, great tasting water right at home for the best quality water for cooking and making delicious coffee, ice. Save money, time, and hassle of buying costly, bottled water and live healthier with ultra-safe water that is contaminant free. The ROES-50 reverse osmosis system delivers high quality clean, filtered drinking water at an affordable price. This complete 5-stage water filter system is made from high caliber components to offer exceptional contaminant rejection rates and long-lasting, reliable performance. Designed and assemble in the USA by leading reverse osmosis manufacturer APEC Water Systems, the ROES-50 is an affordable workhorse with a proven lineage of success in water filtration. Guaranteed to remove up to 99% of all contaminants, such as chlorine, taste, odor, toxic fluoride, arsenic, lead, and chromium. This efficient and productive ro system will provide your family with trouble-free, high quality drinking water for many years to come. Supreme quality - designed, engineered, and assembled in USA to guarantee water safety & your health. America's No.1 rated water filter brand with 20 years of success guaranteeing trouble free, noise-free system for long lasting, dependable, pure drinking water. 2 year extended manufacturer warranty with registration. System comes with all parts and industry's best instructions and videos for an easy DIY experience. High quality leak-free quick connect fittings require no extra lock clips to seal leak, and does not rely on water leak detector to protect your home like other brands. This water filter straw is ideal for emergency and outdoor use. Safely drink up to 1,500 liters of water from nearly any lake, river, spring, well or even rainwater with up to 4 different uses including filter extension, portable water storage, and prefiltration. 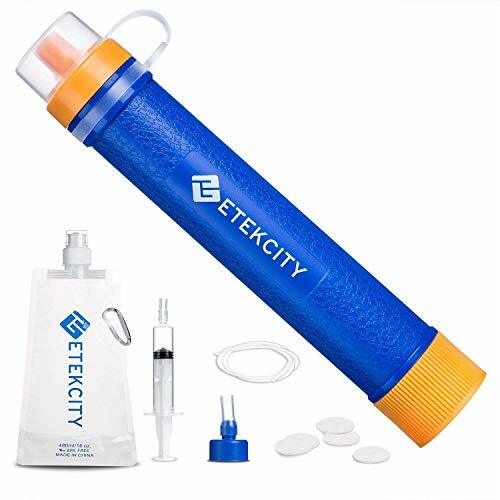 The Personal Water Purifier by Etekcity filters 99.9999% of colibacillus, legionella, heavy metal ions, remained chlorine, VOC, organic and insect contaminant. Take your outdoor explorations to the next level with the Etekcity Personal Water Purifier. You can hook your purifier to a water pouch and fill the pouch with the available water, even if it isn't clean. Just attach the purifier straw to the hydration backpack you already own and drink water from lakes, ponds, rivers and streams . Portably designed to carry safely filtered water on-the-go with the foldable water bag, making it ideal for any camper or outdoors traveler in areas where water is scarce. the extension tube allows users to drink water from further and inaccessible distances and depths. Easy to apply and remove, the pre-filter safely provides extra filtration when water is more turbid or contains organic or any insect contaminants. Keep the filter clean and clog-free with simple pressure pump operation. Introducing the Direct-Connect To Existing Faucet Water Filtration System Premium Class 1 by Woder. Filtration system is built with improved head with a built-in valve that turns the water off when unscrewing the filter. That means NO LEAKS, easy installation, and the opportunity to purchase a cost effective replacement filter (ASIN B0144MFN92). We all like the taste of mineral-heavy water, and with the state of today's public water systems, health need always be at the top of mind when considering a filtration systems. Replacing a filter every 6 months is frustrating and expensive. And while Reverse Osmosis filters remove harmful minerals, they also remove essential ones, resulting in dead water. The Woder 10K-Gen3 leaves these essential minerals, leaving clean, crisp water how it's supposed to be. What if you could get a filtration system that transformed your water into completely clear, beautifully filtered water that tasted and smelled more pure and fresh than ever? And what if this filtration system needed only to be replaced once every 10,000 gallons (Compare that to standard under sink water filters that have an average life span of only 6 months to 18 months and 1,000 to 5,000)? LASTS FOR A MINIMUM OF 3 YEARS OR 10,000 GALLONS - Notes: For longest life, use with municipal treated cold water only, not well water. Do not use with salty or softened water. Connects for use only with cold water for drinking. NO PLUMBING REQUIRED - Comes with 'Direct Connect' hoses that fit standard 3/8 water valves under US kitchen and bathroom sinks. The 3/8 Direct Connect Hose are made to install directly to the existing cold water valve and faucet stem under your sink. 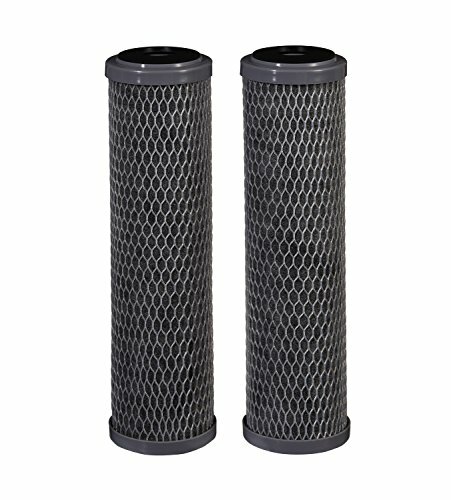 Replacement filters ASIN B0144MFN92. PURE AND HEALTHY WATER - WITH NO MORE BOTTLES IN THE FRIDGE - Eliminates lead (99.9%), heavy metals, chlorine (99.9%), chromium 6, mercury, volatile organic compounds, carcinogens, and other contaminants, as well as turbidity, odors and bad tastes, so you and your family enjoy pure, healthy, spring-fresh water from the tap. SELECTIVE FILTRATION - Woder filters have a unique technology that removes over 99.99% of contaminants while leaving in all essential minerals (Reverse osmosis filter out everything, including the minerals your body needs. As far as nutrition goes, experts consider it essentially dead water). Waterdrop ACF Faucet Filtration System System Specifications - Operating Temperature: 41-122 / 5-50 - Operating Working Pressure: 15-58 psi / 100-400 kPa Your Needs, Our Priority Waterdrop has become a well-known professional water filtration brand. But we still continue to think in customer's place: in what way and for what do you need optimized water? Which products best meet your needs? We have always oriented ourselves to the distinctive characteristics of different customers. We find out that in some countries, tap water is often highly chlorinated and has more contaminants, which is undrinkable, even not safe enough to wash vegetables or to shower. To best satisfy different needs, we launch versatile household filtration products for everywhere you use water in your home, including Pitcher Water Filtration System, Faucet Water Filtration System, etc. You can now instantly access clean water straight from your tap or your pitcher without consuming expensive plastic bottled water. Moreover, we believe drinking clean water is the basic human rights, so we are committed to delivering clean water to everyone. Together with The Water Project, we invest in better sanitation in schools in Africa to offer children a better future. Every time you buy one filter, one child will get one day supply of clean water. Till now, thousands of students and families are benefiting from this project, enjoying clean and safe water. The Advantages of Waterdrop ACF Faucet -Lead & Fluoride Reduction -Ultimate adsorption capacity -320 gallons super long life -0.5 gpm high flow rate -Switch lever allows quick switch from quality filtered water to regular tap water Every faucet filtration system comes with 100% satisfaction guarantee. We value your feedback, so if you have any issue, please feel free to let us know. We will take care of you right now! LEAD & FLUORIDE REMOVAL: Upgraded filtration technology to remove lead, fluoride and other contaminants, offering safer and refreshing water for you and your family. FAST&EFFECTIVE: The innovative ACF material features great and fast filtration. You will fill up 4 water bottles (16.9 oz for each) in 1 minute. CONVENIENT: Simple switch lever allows quick switch from quality filtered water to regular tap water, which will prolong the filter life. IMPORTANT: Works with standard faucets. Does not fit pull-out, hand-held, spray style faucets or faucets with sensor. Please verify if our product suits your faucet before purchase per the detailed instructions in product pictures. SATISFACTION GUARANTEE: Our 30-day money-back guarantee and limited one-year warranty against defects in materials and workmanship for your worry-free shopping. Note: The operating temperature of this faucet system is 41-122 / 5-50 . EASY: The filtered water faucet adopts leak-proof technology and can be attached to your faucet very easily with the various adapters included. GREAT VALUE: The filter will replace 2,000 plastic bottled water (16.9 oz for each). Protects the environment with little waste on plastic bottles and saves your money. 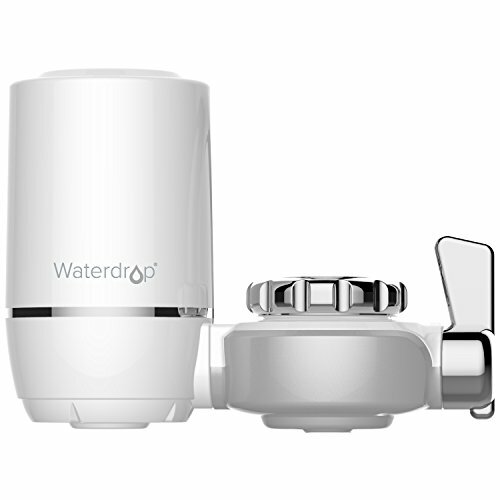 PROFESSIONAL Waterdrop: For years, Waterdrop is committed to elevating your daily life with cleaner and better-tasting water. Warranty: 100% MONEYBACK GUARANTEE. We offer 30 days return and 90 days replace (at no charge) after the date of original purchase for risk-free purchase. 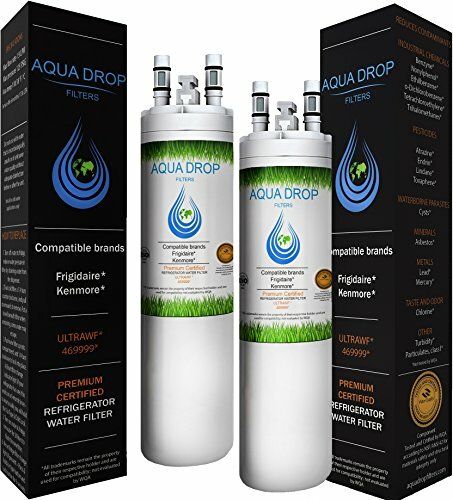 ULTRA REVERSE OSMOSIS TECHNOLOGY AquaTru's exclusive, patent pending Ultra Reverse Osmosis Technology miniaturized the same reverse osmosis technology used by all the major bottled water brands so every American can have purified water right from the tap quickly, easily and affordably. 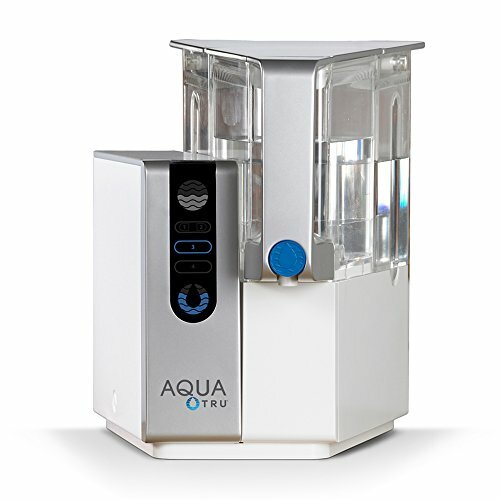 AquaTru is a compact countertop water purifier with the size and convenience of a coffee machine, just plug it in and get started drinking pure, safe great-tasting water today. No more wasting time, hassle and money on expensive bottled water or ineffective filters that just do not remove the contaminants needed to keep you and your family safe. AquaTru removes the most dangerous chemicals and toxins in your tap water! IS YOUR WATER SAFE TO DRINK? Studies continue to pour in regarding Toxins, Hormones, Microplastics, Cancer-linked Carcinogens and other contaminants discovered in our Tap Water, Filtered Water...and yes, even Bottled Water. Arsenic, lead, chromium, and drug residues are commonly found in municipal drinking water. AquaTru's ultra pure reverse osmosis water filter system is CERTIFIED to remove such contaminants and many more! CERTIFIED to NSF Standards by IAMPO to remove 15X more contaminants than the leading pitcher filters --- removing such poisons as Lead 99.1%, Chromium 97.2%, Copper 95.2%, Fluoride 93.5%, Radium 96.4%, and Chlorine 96.6% (to name a few). In fact, AquaTru is designed to remove 1000's of pollutants that could be lurking in your tap water. Taste the Difference! NO PLUMBING OR INSTALLATION required - takes less than 3 minutes to set up. AquaTru's Trusted & warranted RO countertop system COSTS CONSIDERABLY LESS than fully installed under-the-counter RO systems, while at the same time, delivering often Cleaner, Purer, and Better Tasting Water. Why waste money & landfills on bottled water (93% recently found to contain micro-plastics). Invest in your health, the planet & long-term savings with a true RO system. QUICK CHANGE TWIST AND SEAL FILTERS come included with your first Aqua Tru system, and last from 6 months to 2 years. SLEEK COMPACT DESIGN - 14'' Tall x 14'' Deep x 12'' Wide - Purifies 1 gallon of tap water into bottle-quality water in 12-15 minutes. 100% SATISFACTION GUARANTEED - Many popular water filters and water purifier systems claim to turn dirty water 'pure', but unfortunately, leave numerous serious chemicals and containments behind. With AquaTru, you can feel confident that you are getting ULTRA-PURE WATER from a reverse osmosis system that has undergone extensive analysis, tests and certifications. 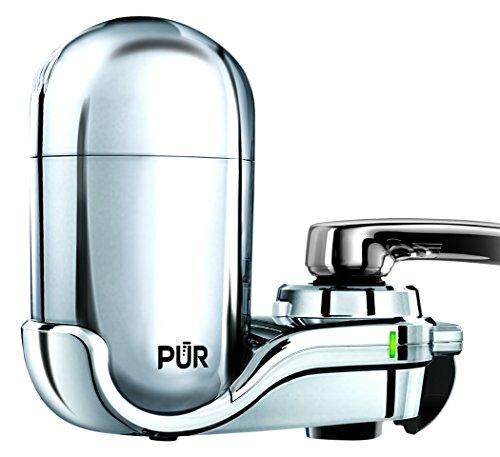 The improved next generation of PUR faucet water filter is at your service with the PUR Advanced Faucet Water Filter - Chrome FM-3700B. With 1-click installation, superior contaminant removal, and a Two-year warranty, there's never been an easier or more reliable way to get PUR water. Each PUR faucet water filter gives you up to 100 gallons (2 3 months) of clean, healthy, great-tasting water. Nutrition Water Activated carbon minimizes the taste, odor, deposits, dirt, rust, turbidity, heavy metals and harmful deposits of chlorine. In addition to protecting you from harmful chemicals and particles, advanced carbonization technology removes odors and odors. 100% Satisfaction Promise If there is any problem with the product, we will refund the fee. If you have any questions, please contact us by email first. We will help you solve it. COMPATIBLE with a tight seal and fits all original refrigerator models by Frig|idaire, Frigi|daire Ga|llery, Profes|sional, French Door & Side By Side Refrigerators U|LTRAWF and Ken|more part # 9999 469999, 242017800, 242017801 and more! Organic carbon block triple filtration technology to reduce the chlorine and peculiar smell, reduce it can reduce impurities such as lead, iron, mercury and other pollutants, keep the minerals in the water, ensure that the refrigerator filter, high-quality water, and ice. 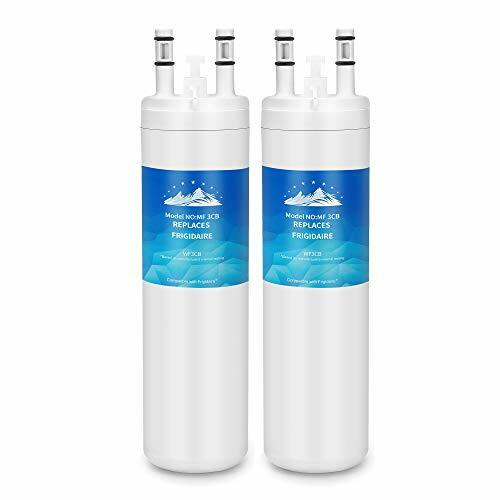 COMPATIBLE with Frig|idaire U|LTRAWF water filters , Frig|idaire Ga|llery, Profes|sional, French Door & Side By Side Refrigerators and Ken|more part # 9999 469999, 242017800, 242017801 Crystala and more! Easy To Use: Unique design, easy replacement installation, easy for installation and operation, no tools required. Water Filter - Component Tested and Certified by WQA according to NSF/ANSI 42 for materials safety and structural integrity. 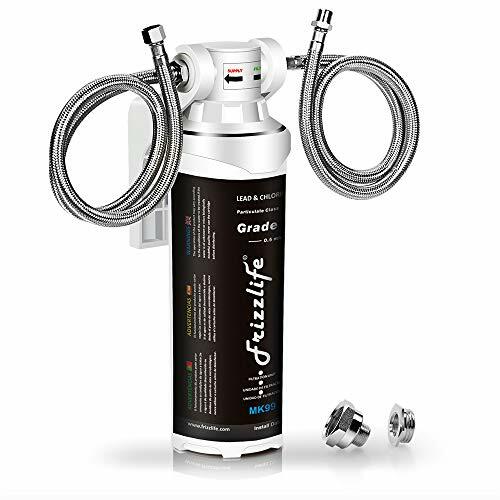 Frizzlife Under Sink Water Filter System-High Capacity Direct Connect Under Counter Drinking Water Filtration System-0.5 Micron Quick Change Removes 99.99% Lead, Chlorine, Bad Taste & Odor. FITS BOTH 1/2" AND 3/8" COLD WATER LINE: Super EASY Installation. Come with 3/8" DIRECT CONNECT hoses that fits standard 3/8" feed water valves under US kitchen sinks. The Inline water filter system also come with a 3/8" to 1/2" converter fittings allow the system directly install to the existing both 1/2" and 3/8" cold water line and faucet under your sink. Took less than 3 minutes and NO PLUMBING REQUIRED! New installation video available. BEST AUTO SHUT OFF DESIGN: Utilizing quick change twist-in installation design makes it take less than 3 minutes for you to install the system or doing a filter replacement. Provides quick twist connection for easy, tool-free, no mess filter replacement. The filter cap is designed with BUILT-IN shut off valve. You don't even need to shut off the water supply whenever you work on the filter cartridge replacement. HIGH FLOW RATE & MULTI-USAGE: Enjoy tap water as pure and healthy as spring fresh water. Tested Full Flow Rate 2.0GPM @40 psig. Good for cooking, washing fruits & veggies and cleaning dishes without watermarks. TWO-STAGE ADVANCED WATER PURIFIER WITH 0.5 MICRON: The Frizzlife MK99 Water Filtration System include a TWO-STAGE High precise compoud filter, which has a unique technology that removes over 99.99% of contaminants while leaving in all essential minerals. Eliminates LEAD, HEAVY METALS, CHLORINE, CHROMIUM 6, MERCURY, RUST, VOLATILE ORGANIC COMPOUNDS, CARCINOGENS, AND OTHER CONTAMINANTS, SUCH AS TURBIDITY, ORDORS AND BAD TASTES. Enjoy PURE AND HEALTHY WATER From the tap. NO more bottle water! 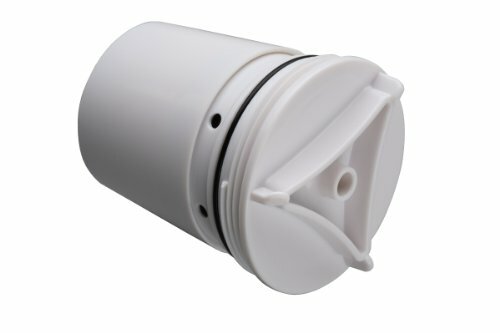 MONEY SAVING & 100% SATISFACTION: The under counter water filter system contains a core filter cartridge inside the housing, you will only need to replace the core part of the filter cartridge instead of throwing away the whole plastic part, it will save you much money on replacing the cartridge and will do a lot of helps on the environmental protection. Each cartridge with high capacity can be used for 2 years or 1,600 gallon water, for better filtration, suggest to replace after 6-8 month. Only filter that replaces most Brita and Mavea filters at a fraction of the cost so BUY NOW since this promotional price is for a limited time only! Why are BWT Water Filter Products the Best in the World? 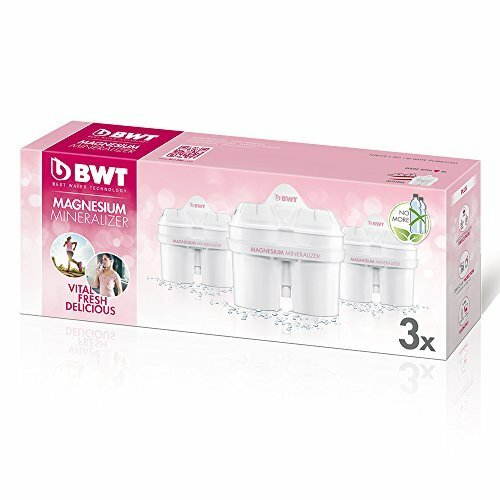 - The patented BWT Magnesium technology not only reduces chlorine, heavy metals and scale, but also mineralizes the water with valuable Magnesium, making it taste natural, balanced, fresh and ranking highest in consumer taste tests around the world. Unsurpassed Filtration - Cleaner - No black bits in the water, Faster - No pre-soaking required to activate filter, Safer - Contains silver to provide antimicrobial protection and prolong filter life, Stability - Designed to deliver stable performance over the life of the filter. The filter ingredients won't get packed down at the bottom and reduce filtration efficacy. We are the only seller that had BWT make a custom filter formulation for US water characteristics. Technology & Design With the Most Awards - Red Dot Design Winner | Home & Trend Award : Innovation of the Year & Golden Award Best of the Best | EESC European Award - Best Product of the Year | Winner of Plus X Award. Superior Taste for Hot & Cold Beverages / People Need Mg2+ - Magnesium is a natural mineral and flavor carrier which enhances the aroma and taste of tea and coffee and provides a much better crema. Mg2+ has become a crucial mineral lacking in our diet. It is estimated that > 60% of adults in US do not receive the minimum daily requirement. We aim to provide an economical quality filter for anyone who wants healthy, pure drinking water. Filters are independently tested to reduce lead, iron and other contaminants. Make sure this fits by entering your refrigerator model number. This filter removes most of contaminants: Reduces Odor, Chlorine, Dist, Rust, Turbidity, Heavy Metal and Harmful Sediments, Brings Your Family A Clearer Pure Healthier Water and Healthier Life. For the cleanest water, replace your filter every six months (to maximize contaminant reduction). Non-polluting: Reduces odor, chlorine, dryness, rust, turbidity, heavy spirits and harmful deposits by more than 100% through activated carbon filter, while maintaining beneficial and beneficial raw minerals for human health.